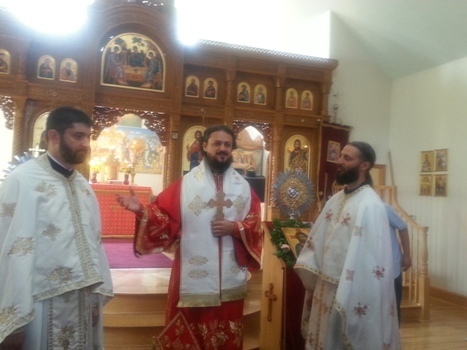 Portland, OR - On the Tenth Sunday after Pentecost, August 10, 2014 Bishop Maxim of Western America officiated at the Holy Hierarchical Divine Liturgy at the St. Stephen the Protomartyr Serbian Orthodox Church in Portland, Oregon. On this day the Transfer of the Relics of St. Stephen was celebrated, the feast day to which this church is dedicated. Taking part at the liturgy were many parishioners from Eugene, together with their priest Fr. Daniel. Concelebrating with Bishop Maxim were Fr. Daniel Mackay from Eugene, Fr. Milan Unkovic, the new priest in Portland and Deacon Stephen Dyer. After the reading of the Gospel Bishop Maxim addressed the faithful with pastoral words. Following the communion of the faithful and the cutting of the Slava Kolach, an agape meal was prepared in the church hall, during which Bishop Maxim held a spiritual talk with the faithful people. The joy of the Lord's Day of Holy Sunday was continued in songs sung by the brethren, brothers and sisters from Eugene and the Portland parishioners. Everything that breathes praise the Lord!